My husband and I got married in Cozumel, MX. We've been there many times and love the culture, people, color, scenery, and local flavor. It inspired us to create our baby's nursery to reflect a bit of what we love about Cozumel. I hand painted the tree trunk and branches. For the leaves and flowers, I used organic leafy and floral shaped vintage Indian Printing Blocks (originally used for creating patterns on fabric)and just stamped them randomly on the walls and ceiling after dipping in various paint colors. 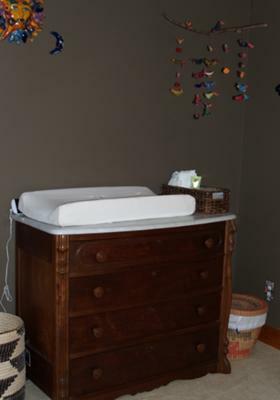 We had the mirrored dresser, which was original to our 1904 era house, found a piece from the same era, but without a mirror and glove drawers on E-Bay for the changing table, and the rocking chair was my husband's great grandmother's, which she used to rock his 92 year old grandmother in as a baby. The window treatments are simple white sheers, with a room-darkening roller shade behind them. I wanted to keep a simple, clean, breezy feel with the windows. Lighting is a simple white fixture, again, with a clean, breezy feel so as not to distract from the other features in the room. Nursery wall decor is hand painted Mexican Talavera (pottery) shaped like various creatures - frogs, lizzards, bugs, birds, butterflies, and dragonflies. Some were carried back from Cozumel trips, others were purchased at a local Mexican import store. I made the mobiles by hand, stringing fabric birds with fishing line and hanging from tree branches I found in a friend's yard. The hardest part was taking all of the wallpaper down that the previous homeowner had plastered EVERYWHERE. 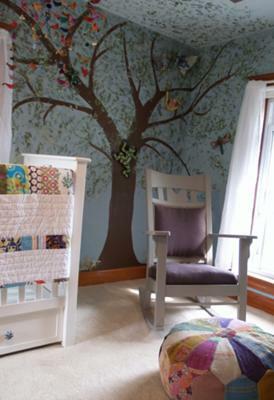 This was a room that we really didn't use since moving into this house a couple of years ago, so we didn't have the need to remove the wallpaper until it was time to make room for baby. That process took weeks, including spackelling and sanding the damaged areas after the wallpaper was removed. The painting process was fast and easy since I had a vision of what I wanted to end result to look like. I thoroughly enjoyed painting the tree for our little guy, though it was a little nerve-wracking at first since I had never done a mural myself. 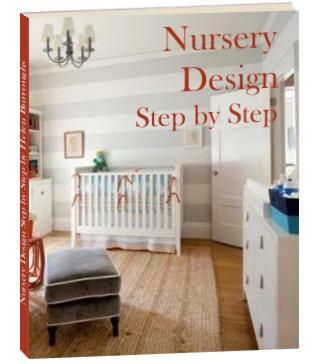 I did the entire nursery with the help of my husband (wallpaper removal and furniture set-up) and my dad (wall sanding). Its so serene and comfortable, yet stimulating and colorful. 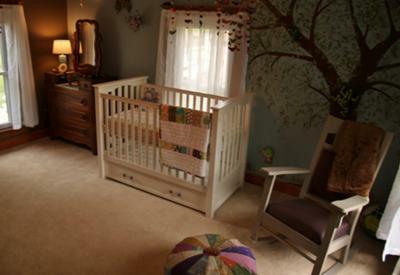 Melanie is so creative and the nursery she designed is out of this world. Very calm setting, perfect environment for a baby! Wonderful job Melanie!